As part of the October 2018 VPR - Vermont PBS Poll asked Vermonters: "To what extent do you think racism is a problem in Vermont today? Would you say it is a big problem, somewhat of a problem, a small problem, or no problem at all?" The October 2018 VPR - Vermont PBS Poll gives a glimpse into where Vermonters stand on statewide political races and issues — and one of those issues is race. Tabitha Pohl-Moore, Vermont director of the NAACP and president of the organization's Rutland-area branch, helps us dig into the poll results. As part of the poll, we asked hundreds of Vermonters to what extent they "think racism is a problem in Vermont today." Fifty-three percent of respondents said racism is a "big problem" or "somewhat of a problem," while 43 percent responded that racism is a “small problem” or not an issue. The demographic breakdown of the poll results shows some partisan split over the issue of racism. Thirty percent of Republicans, 47 percent of independents and 70 percent of Democrats think racism is either a "big problem" or "somewhat of a problem." Meanwhile 65 percent of Republicans, 41 percent of independents and 28 percent of Democrats say they think racism is either a "small problem" or "no problem." Tabitha Pohl-Moore spoke to VPR's Mitch Wertlieb. Listen to their full conversation above. 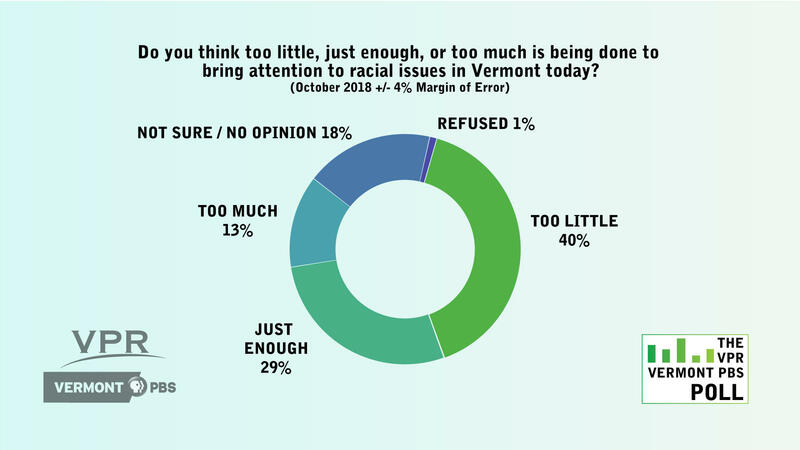 The October 2018 VPR - Vermont PBS Poll asked Vermonters: "Do you think too little, just enough, or too much is being done to bring attention to racial issues in Vermont today?" There's also a geographical divide when it comes to racial issues, according to poll results. In a separate question, Chittenden County residents were the most likely to say that "too little" is being done as far as bringing attention to racial issues in Vermont, while Northern Vermonters are the most likely to say that "too much" is being done. Additionally, 24 percent of Republicans say "too much" is being done about racism (compared to 4 percent of Democrats). “I’m almost at a loss. Like what does it mean that there's ‘too much' being done?” says Pohl-Moore, who says those numbers deserve a deeper dive and more explanation from the people who feel that way. “There are often some misconceptions or misperceptions, or lack of information, and again in Vermont it wasn’t until recent that we really started paying attention to what’s going on here at all," she says. "So I’ve got to think that it’s going to take more time to get those folks who are least affected to actually care about the issue." Pohl-Moore says a poll is a start, but more conversation is needed. The VPR - Vermont PBS Poll asked hundreds of Vermonters questions to learn about their thoughts on key issues and how they feel about candidates for statewide office. Explore the full results of the October 2018 poll here. 'Laugh Because It's Funny... Cry Because It's True': SNL Sketch Skewers Lack Of Diversity In Vt.
Saturday Night Live made some fun of Vermont last weekend, with a sketch featuring a group of Southern white nationalists who discuss where to find a “Caucasian paradise.” The skit contrasts Vermont’s liberal, bucolic image with some uncomfortable realities, and was welcomed by people inside and out of the state. Racial disparities in traffic stops by Vermont State Police are improving, but there are still gaps between the rate at which white and black drivers are stopped and searched. Gov. Phil Scott and the rest of Vermont’s incumbent statewide officeholders appear to be on a safe track toward re-election, according to the results of a new poll commissioned by VPR and Vermont PBS. Little more than two weeks before the Nov. 6 election, a new VPR - Vermont PBS poll sheds light on where candidates stand with voters - and the issues on the minds of Vermonters. We're digging into the poll results and what they tell us about the upcoming election and what issues Vermonters will be focused on beyond November.